In Roman times, Pompeii was a town along the shores of current day Italy. The town lived at the base of a rather large volcano called Mount Vesuvius. Pompeii is famous for being totally destroyed when Mount Vesuvius erupted in 79BC. Research shows pyroclastic flow incinerated people and buried the entire city in 10-20feet of ash. A researcher named Giuseppe Fiorelli discovered during excavations that over time the bodies of people had decayed away leaving pockets of air in the solidified ash. He filled these pockets with plaster of Paris and made forms of the bodies that were once there, capturing the last moments that person was alive. These ghastly images are known the world over. When my older sister and I were children, I was always curious about what she was learning in school, so I read all of her books. I vividly remember reading The Dog of Pompeii by Louis Untermeyer. It was the story of Tito, a poor blind boy who lived in the streets of Pompeii with his dog, Bimbo. Bimbo would steal raisin bread from the street vendor and bring it to Tito. Tito’s life was rough and Bimbo was his only friend, his best friend. When Mount Vesuvius exploded, all the people panicked and none of them had time to care for the blind boy. Bimbo tried to lead Tito to safety but Tito’s strength gave out and he collapsed. Bimbo could not get Tito to respond, so Bimbo did the one thing he would never want to do, he bit Tito. Tito yelled and started to run away from Bimbo. Bimbo guided him toward the safety of the harbor and the boats which were leaving by biting at Tito’s feet and forcing him to run faster. The men on the boat grab Tito who is yelling “Bimbo! Bimbo!” searching for his dog who the boat has no room for. The next line starts “Eighteen hundred years passed.” The story ends with scientists who are restoring the city and they find the skeletal remains of a dog holding a piece of petrified raisin bread. The story affected me emotionally and led me to reading more, learning more and reaching beyond my comfort zone, about Rome and Pompeii and the geographic history of that part of the world. It made me curious about animal behavior which later in life I studied at NC State University. It sparked a passionate love for reading which I have become a bit of a snob over as an adult. I could view that one story as a small hinge upon which my entire life changed direction. I remember crying thinking about that dog and imagining what a terrible ending that must have been, but understanding the love and dedication. I remember crying for the loss, and the pain of the tragedy. With time, I came to understand it was a fictional story, but the fact someone, used a story to change how I felt, changed how I looked at things. I began to see storytelling as an art form, a way to convey feelings. Today I long for stories which stir my soul and engage my emotions as The Dog of Pompeii did so many years ago. 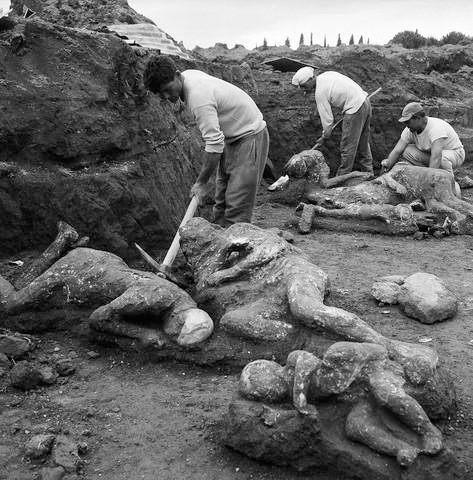 When I heard there was to be a movie about the destruction of Pompeii, it stirred those childhood memories and I wanted to see it. When I learned it was to be 3D I was even more excited. Today’s 3D effects are truly remarkable. I was excited to see this movie. Then I learned that Emily Browning from Sucker Punch would star with Carrie-Anne Moss who played Trinity in The Matrix and Kiefer Sutherland who is awesome! It was an all star cast made in a time when special effects have caught up to the potential of the idea the director has and the movie is about a subject matter I am already emotionally invested in. Sounds like the perfect movie, right? Let me be clear in how disappointing this movie is: it sucked. Bad. I’ll tell you what this movie is exactly: If you cross Titanic, Gladiator, and Dante’s Peak, you have this movie. The story in this movie is identical to Titanic: two uber cheesy, star crossed lovers, run to the end of the hallway and fight the bad guys as the world falls apart around around them. In Titanic the bad guy feels the need to chase Jack and Rose around the ship, shooting at them as the ship sinks. 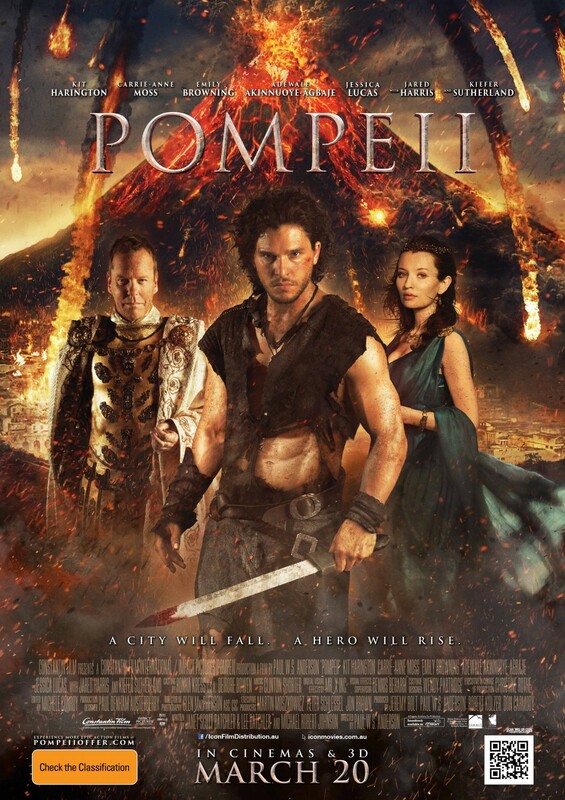 In this movie, the ship is the city of Pompeii. Just like Titanic, only the last 20 minutes are even remotely cool. The 3D volcano effects are badass, but you have to put up with an hour and a half of some stupid back story about Kiefer Southerland wanting to blackmail Emily Browning into marring him just to get to it. If, like Sucker Punch they had just gone, “Hey, we’re in Pompeii” then showed the eruption for an hour it would have been a been a better movie. This tries to have a Gladiator fight, a love story and a buddy movie all at the same time. But none of it works well because it is just all trite posthumous crap. I liked Sucker Punch because it was a visual movie. It had little to think about, but a tone of tongue in cheek, T&A. It did not take itself seriously. This movie is not that. Granted I may have had too high an expectation going into this movie, but it is a bad warmed over Titanic script with volcano special effects and a poorly done gladiator fight in the middle. Of the Ronin Sherpa scale of 5 Swords, I give this movie a 2. I am only giving it a 2 for the visual effects and the 3D and the fact that Emily Browning is really nice to look at. I just wish she were a better actor, and I wish this movie was better. This entry was posted on February 22, 2014 at 8:57 am and is filed under Uncategorized. You can follow any responses to this entry through the RSS 2.0 feed. You can leave a response, or trackback from your own site.